Home / Our Blog / Employee files for unemployment – what does this mean? If one of your household employees has recently filed for unemployment benefits, you may have received notice from your state and be unsure of what to do. This brings up the question: what does it mean when an employee files an unemployment claim? Here we will break down some of the basics about unemployment claims and explain what’s required of you as the employer. Unemployment claims come when an employee files to get unemployment benefits after being terminated from a job. This gives the person financial help when they aren’t working for a reason that is out of their control. The person will get regular payments based off a percentage of the employee’s income for a period of time, generally up to 26 weeks. Recipients must be either actively seeking work or enrolled in a job training program, and must be physically able to work. Household employers pay unemployment taxes to fund benefits distributed by the state’s unemployment compensation system. Because you paid your unemployment taxes, you are never directly on the hook for any benefits paid. Did you know that the #1 way families get caught paying off the books is an unemployment claim from a discharged household employee? What happens when a former employee files a claim? When your previous employee makes a claim for unemployment through the state, you will receive a notification to verify their reason for unemployment. You will be asked to provide basic information on the employee including why they are not employed with you any longer, as well as information on any compensation that you have or are willing to pay. This could be severance pay, pay out of unused vacation, or a final pay check being delivered a week after the employee stopped work. DO reply to the state's inquiry - many states levy a fine if you do not respond or respond late! If you have recently let your nanny go because you simply were not compatible or if attendance was an issue, the nanny will still probably get benefits, unless you have excellent documentation that the employee was fired for misconduct. This means you have terminated the person’s job on the grounds of dishonesty, violation of household rules, repeated tardiness or inexcusable absences, risk of harm to you or your family, or insubordination, just to name a few. 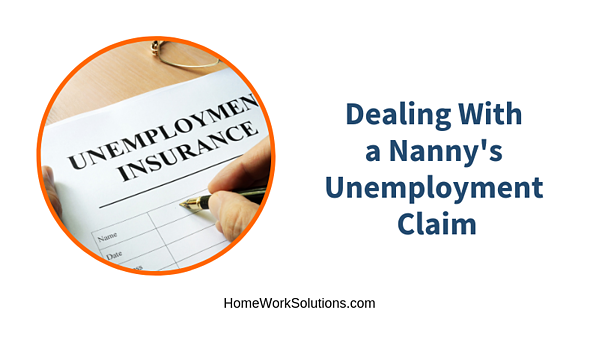 If your nanny left voluntarily because she had a new job, and that new position is terminated within 52 weeks, you may still receive information an inquiry about her unemployment claim. This is because benefits, when awarded, are charged on a pro-rata basis to all employers within the state's established "base period. " Most nannies are let go because the family's circumstances have changed. Most typically the children outgrow the need for a nanny and move on to either full time schooling or a child care facility. Sometimes the family moves, and the new location is either out of the area or sufficiently far away to make a commute by the nanny impossible. In these instances it is very straightforward. The nanny will be awarded benefits because the job ended for reasons not due to her performance. Still unsure of what it means when an employee files an unemployment claim after they stop working for you? Our team at HomeWork Solutions can help. We will walk you through the various steps that are required to make sure that you’re set up correctly when initially hiring the person, including the establishment of your unemployment insurance account. Then, if something goes awry and you terminate the employment, we can help answer questions that may come along with that.